The name of this recipe is oh-so-fitting. Disgustingly rich, sweet, chocolately, buttery...and extremely addictive. 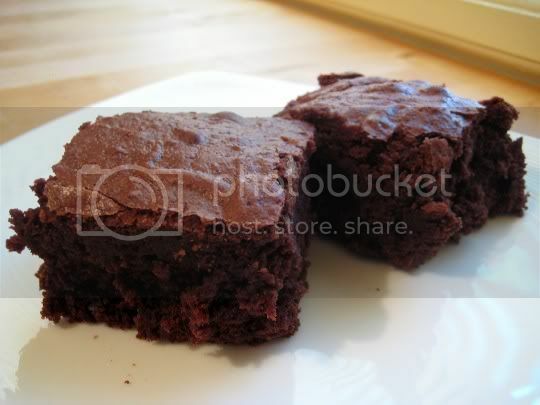 What's probably more amazing is how easy these brownies are to make and how few ingredients they need. Melt some butter, add some sugar and cocoa powder, mix in eggs and vanilla, add some flour and salt...bake and you're done! Really, that's it. I suppose nuts could be added to the batter as well, but I'm not a nuts-in-brownies kind of gal. What makes these brownies so rich is the amount of ingredients added: two whole sticks of butter (Paula Deen, anyone? ), two cups of sugar, almost a whole cup of cocoa powder, and four eggs. Divine decadence! Even the finished batter looks rich and fudgy, as the small amount of flour included really seems to be only enough to make these rise. I did have to bake these about 20 minutes longer than the 40-50 minute suggested baking time (and as a result, I had to cut off about a half inch of well-done edges), but the extra time was needed. A nice crisp, almost cookie-like crust formed on top (which made cutting these into squares a little messy), but the inside texture was wonderful. Rich, thick, sticky, moist, fudgy...the perfect brownie! Make again? Definitely. With already-on-hand ingredients and an hour or so to spare, this is an anytime and every time winner. Word to the wise: have milk on deck! "Disgustingly Rich Brownies," KidsCooking: A Very Slightly Messy Manual, Klutz Press, Palo Alto, CA, 1987.